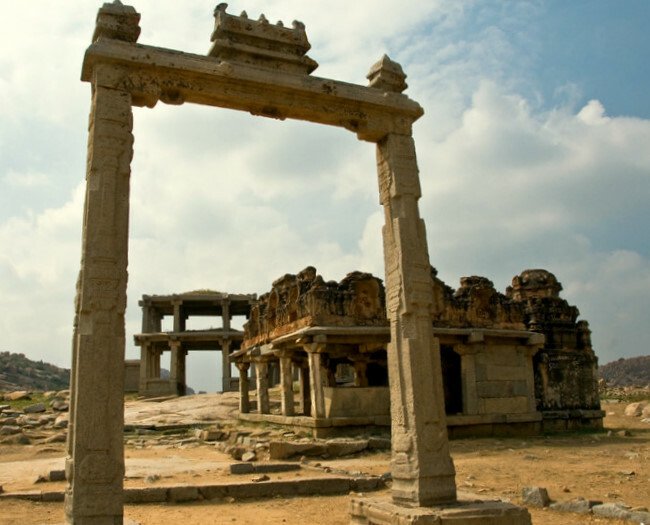 Also known as the Tula Bhara, this monument is made of 2 lofty carved granite pillars soaring to nearly 15 feet high and supported a stone beam across stretching about 12 feet fitted with 3 hoops on its underside. I went closer to inspect the pillars and noticed that one of them has a bas-relief depicting a king with 2 queens. Legend has it that these were depictions of King Krishnadeva Raya and his consorts. 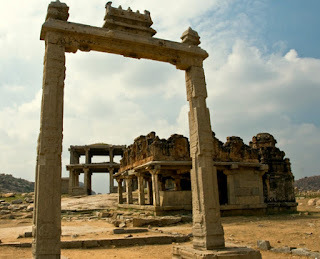 The structure resembles an entrance or a doorway towards the Kampa Bhupa’s Path located behind the Vittala temple. Back in the days, the King's balance was used to weigh the Kings of Vijayanagara and offer charity & donations in form of Grains, Gold, Diamonds and other precious stones to the people from the kingdom. This was done on special occasions like the Solar, and Lunar eclipse. Nice shot of a beautiful architecture. Such an interesting and beautiful piece of architecture, fascinating history and all of that and lovely skies and clouds!! Superb post and photo for the day, Aarti! Wishing you a wonderful weekend! Enjoy! lovely!! and to think i missed this at hampi!!! really have to go again!